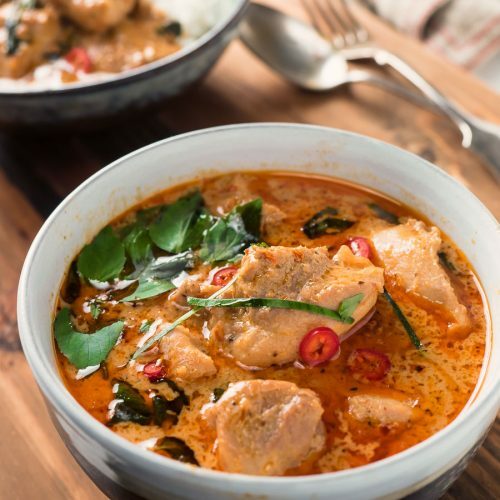 Panang curry is the Thai curry you should be making. Seriously tasty stuff. 5 whole dried chilies - your curry will be as hot as the chilies you choose. Remove the stems from the chilies. Break the chilies into pieces. Cover with hot water and soak for 30 minutes. Combine all the panang curry paste ingredients including the rehydrated chilies in a blender. A mini food processor works well for this if you have one. Add a couple tablespoons of coconut milk and puree. If it doesn't puree add a bit more coconut milk. Sneak up on the minimum coconut milk you need to make it puree. You are trying to puree some pretty hard ingredients. Galangal in particular. This takes a bit of scraping back into the bowl and more time. Be patient. Remember, they used to do this with a mortar and pestle so we have it easy. Heat a wok or skillet over medium heat. Add the oil. Fry all the curry paste for about 2 minutes. Regulate the heat so it doesn't burn. Add the coconut milk and 3 whole lime leaves. Bring to a boil and add the chicken. Cook until the chicken is just done. This takes about 10-12 minutes. You can use an instant read thermometer to check that you've hit 175F (best). Or cut a piece and sneak a peek (not bad). Or guess and hope you don't kill everyone (not so good). If you haven't killed anyone yet, you probably won't this time. But it is a really good idea to start using an instant read thermometer in general. The pros do. You should too. Add the fish sauce and sugar and stir to combine. Remove from heat. Stir in most of the basil. Keep a bit for garnish. Serve with jasmine rice or rice noodles. Garnish with the remaining Thai basil, julienned lime leaves and red chilies if desired.